Apple today seeded the first beta of iOS 10.3.3 to its public beta testing group, one day after providing the beta to developers and two days after releasing iOS 10.3.2, a minor bug fix update. 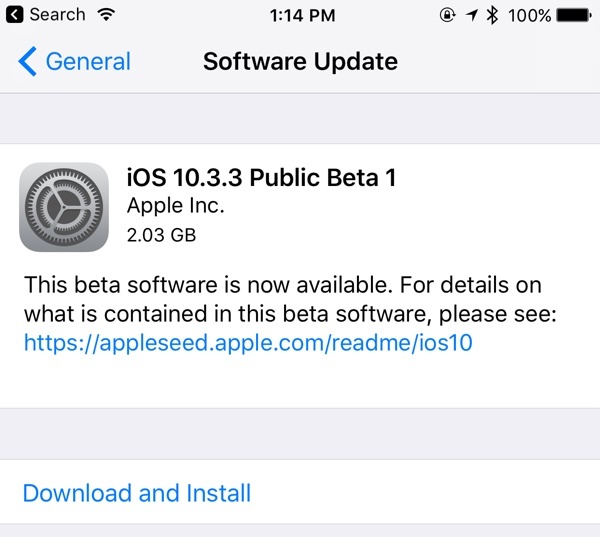 Beta testers who have signed up for Apple’s beta testing program will receive the iOS 10.3.3 beta update over-the-air after installing the proper configuration profile on their iOS device. iOS users who want to be a part of the beta testing program can sign up to participate through Apple’s beta testing website, which gives users access to both iOS and macOS Sierra betas. Because betas are not always stable and can introduce bugs, they should be installed on a secondary device. No significant changes were found in the first developer beta, suggesting iOS 10.3.3 is another minor update that focuses primarily on bug fixes and security improvements. Downloading now, and telling everyone, because I have nothing better to do. Its a full installer. Just like if update through iTunes.